USMLE and Residency Tips: How Important Is Post Interview Contact And Second Visit For Residency? An important question that comes to every residency applicants mind is how important is it to go for a second visit? Or how important is post interview correspondence in getting a high rank on the program rank order list? These are all very valid questions for a residency applicant because there is a significant investment in time, effort and money for the second visit trips and some investment in time and effort in the post interview correspondence. According to the program directors survey 2012, it is evident that not all specialties place equal emphasis on the ‘second visit’ and correspondence after the interview (figure 1). While the publication does not expand on what the post interview feedback comprises of – one can surmise that it is correspondence either via phone, email or in person after an official interview. A second look is likely a official second visit to the program by the applicant. 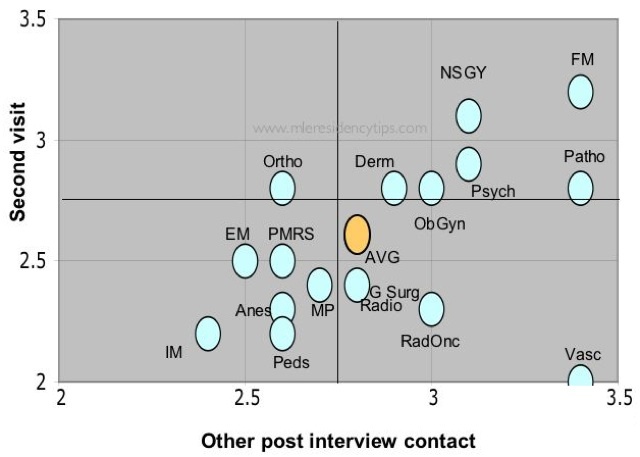 When the importance of second visit per specialty is plotted against other post interview contact, there fields can be divided in to four sections. Interestingly, subjects of family medicine, neurosurgery, pathology, psychiatry, dermatology and ob-gyn placed importance on both second visit and the post interview feed back. Of these family medicine showed the greatest propensity for placing importance on second visit and post interview correspondence. A second quarter was subject that placed relatively higher emphasis on post interview feedback but not so much on the second visit – these subject were radiology, general surgery, radiation oncology and vascular surgery. A third and important section was subjects that did not place as much importance on a second look or post interview feedback and these subjects were – emergency medicine, internal medicine, medicine-pediatrics, anesthesia and PM&RS. One significant outlier was plastic surgery, which is not depicted in the graph because it was (1,1) on the plot indicating that the plastic surgery programs did not place any importance at all to second look or correspondence when compared to other programs. Conclusion: Though being invited to a second interview is not a choice of the applicants, those that do get invited should make full use of the opportunity. This is especially the case in programs like family medicine, which place a strong emphasis on the second visit interview. Another aspect of this is, perhaps it may be worthwhile showing your interest in the program by corresponding with the program faculty in subjects that placed high emphasis on other post interview contact like psychiatry, radiology, pathology etc. Reference: National Resident Matching Program, Data Release and Research Committee: Results of the 2012 NRMP Program Director Survey. National Resident Matching Program, Washington, DC. 2012. If you wish to be in touch and get the latest posts and updates, join me on Facebook or follow me on Twitter. Check out about me section if you want to drop me an email. Also Scroll below ↓ for the most popular articles this week! this article meant FM applicants should ask for a second visit during every interview? It would sound desperate or demanding or make them busy with a second visit? Whom they would ask? PD or PC? The article indicates that FM programs place stronger emphasis on second visit and post interview feedback. it is more meaningful if a second visit is offered by the program as it implies that they are highly interested in you. You could ask for a second visit but if they have not offered for you to come back, the yield of such a trip will be low.